Lead nurturing is a proven method for turning prospects into buyers. Learn how Act-On can make your nurturing efforts fast, easy, and effective. Lead nurturing is a proven method for turning prospects into buyers. It’s done by systematically contacting prospects over a set amount of time and providing relevant content that eases them through the buyer’s journey. The result: More sales, and fewer lost opportunities. Learn how modern marketers are turning prospects into buyers with Act-On's lead nurturing tools. Automated email programs engage your prospects over time through a series of email workflows. Your prospects aren’t just numbers in a database, they’re people with unique interests; in today’s hyper-personalized marketplace, they expected to be treated that way. 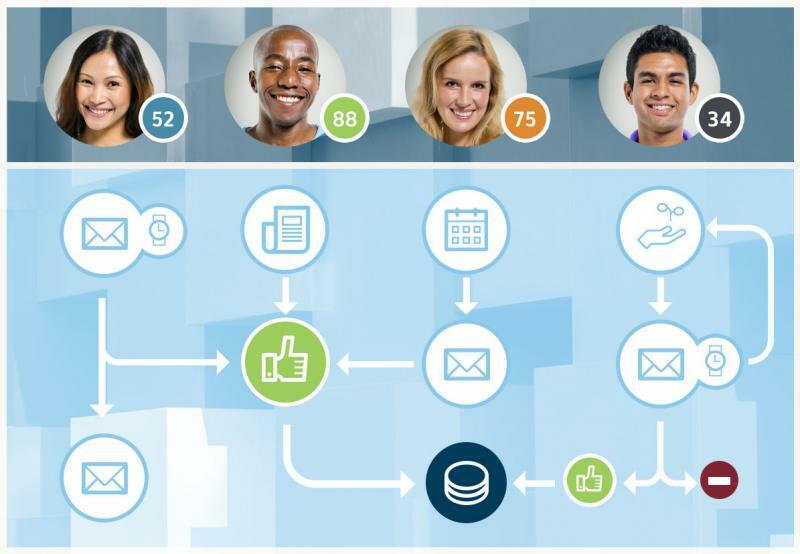 Instead of blanketing your lead list with one-off emails, automated drip marketing campaigns give you the ability to plan out interaction pathways that progress prospects through messaging streams based on their behaviors and preferences. Creating email messages for your automated program is a snap. 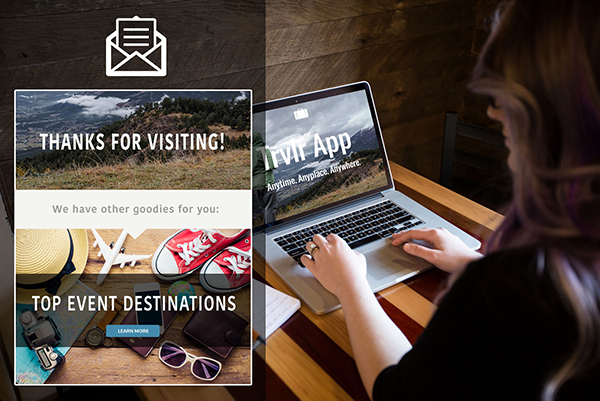 Act-On’s Email Composer allows you to create stunning, responsive email messages that look great on smart phones, desktop clients, and everything in-between. Additionally, Act-On’s dynamic messaging and personalization features allow you to easily tailor messages to specific segments or profile types. Triggered emails average 400% higher open rates and 150% higher clickthrough rates than “business as usual” email messages. (ExpertSender, Oct 2013). With Act-On, you can set up trigger emails to be sent to prospects or customers based on specific actions, like filling in a form, registering for an event, or abandoning a shopping cart. 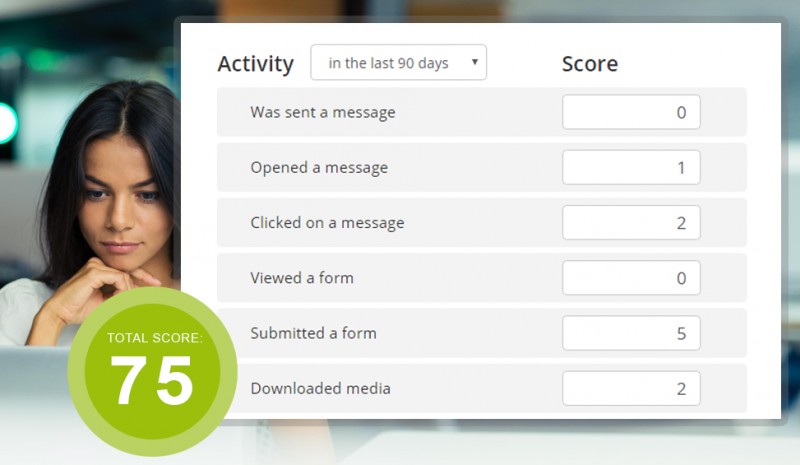 With flexible lead scoring, you can identify and prioritize leads that are ready to buy. It’s easy: Your prospects automatically rack up points based on attributes such as who they are, what industry they’re in, and where they work, and actions such as how they’ve responded to email, engaged with your website, attended your events, and much more. You can nurture each lead based on their score to speed up conversion. When their number hits a certain level, they can be handed over to sales. 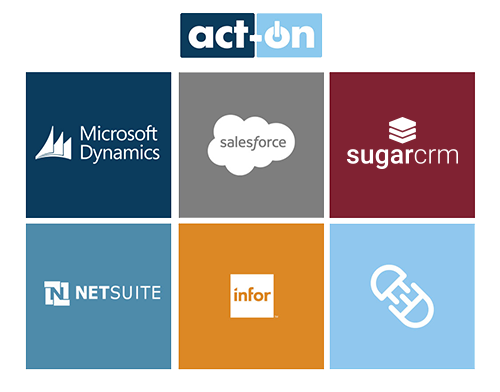 Act-On integrates with all major CRMs so that you can coordinate your sales and marketing efforts throughout the entire customer lifecycle. Marketing can easily pass qualified leads to sales, and sales can send leads that aren’t quite ready to make a purchase back to marketing for additional nurturing. Act-On automatically updates fields, creates tasks, and assigns owners directly in your CRM. 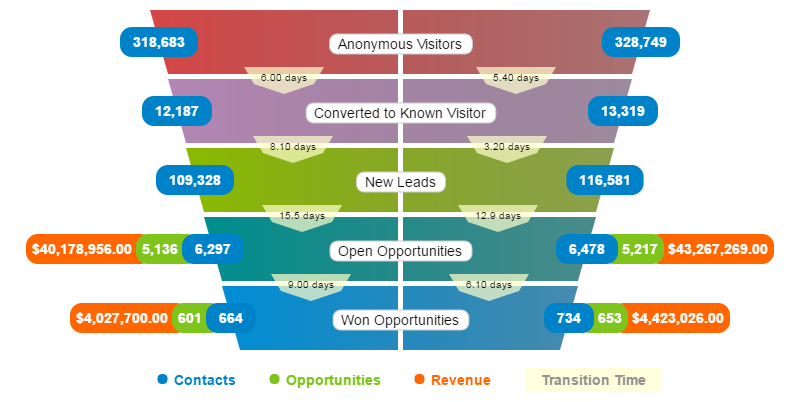 Watch the progress of your leads as they travel through the path to conversion with easy-to-understand funnel reports. These do more than provide instant insight into the effectiveness of your marketing campaigns – they also make it possible to uncover gaps in the conversion process, accurately forecast sales, and determine exactly what campaigns are driving revenue. You can create, adapt, amend, segment, and deploy lists with ease; import them from your CRM; and perform email A/B tests – no database administrator required. Create well-defined segments by combining profile attributes (such as industry, title, or company) with observed behaviors (such as attendance at a specific webinar). Now you can market highly personalized, highly relevant offers to each distinct segment. As your list grows, members are added to segments dynamically.